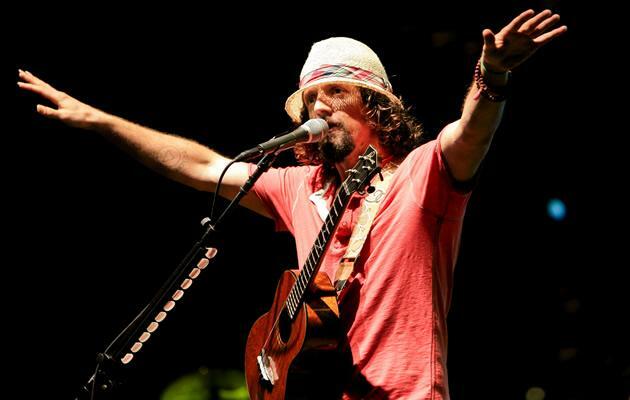 American singer-songwriter Jason Mraz had all the right ingredients for a thoroughly enjoyable, if not mind-blowing one night only performance last Friday. His smooth, clear vocals brought life to his easy listening accoustic tunes, and in person, Mraz exuded a cheeky charisma that got the audience laughing to his jokes and singing along. 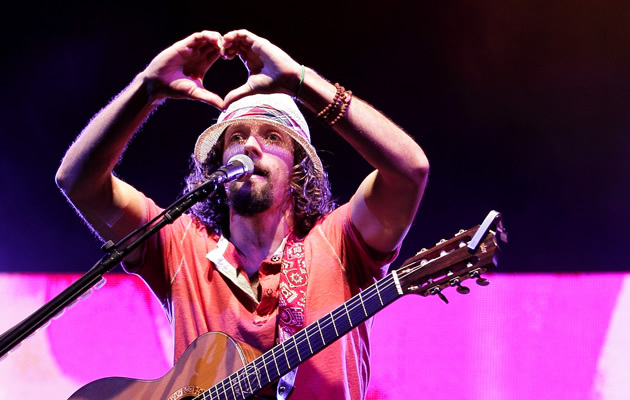 Unfortunately for Mraz, the much-hyped about venue at Gardens by the Bay put a dampener on the spirits of the 15,500 fans who turned up to watch the hippie "I'm Yours" singer live on stage. Fans who came as early as 5 pm to set up picnic mats near the front expecting a chilled-out, breezy garden concert were in for disappointment when they were told by organizers to stand up and move to the front because it was a "free standing" and not seating performance. Office workers who rushed from work with takeaway dinners in hand were told to finish their food before they were let into the Meadow venue or throw it away and purchase overpriced $10 sub sandwiches from vendors nearby. 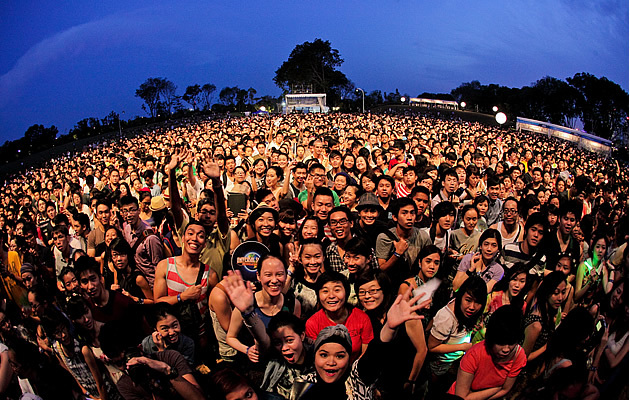 By 7:50 pm, the whole arena was packed and frustrated concert goers started to squeeze out of the stage-front crowd to the two hills at either side of the Meadow for a better view of the concert. 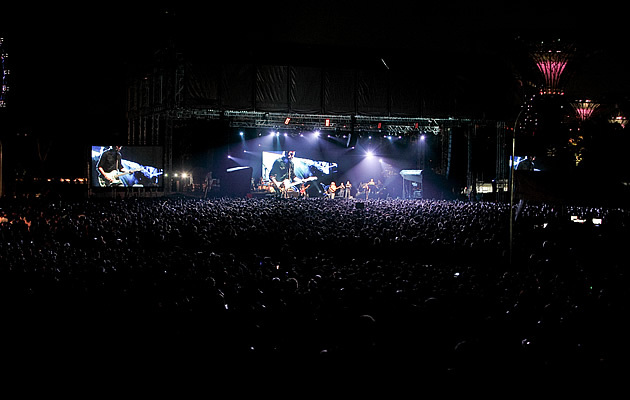 The mood lifted significantly when Mraz appeared on stage channeling Johnny Depp's tree-hugging style - a casual shirt and jeans ensemble complete with chin length curls and growing-out stubble - in marked contrast to his clean cut preppy look when he first burst onto the pop scene with "The Remedy" ten years ago. 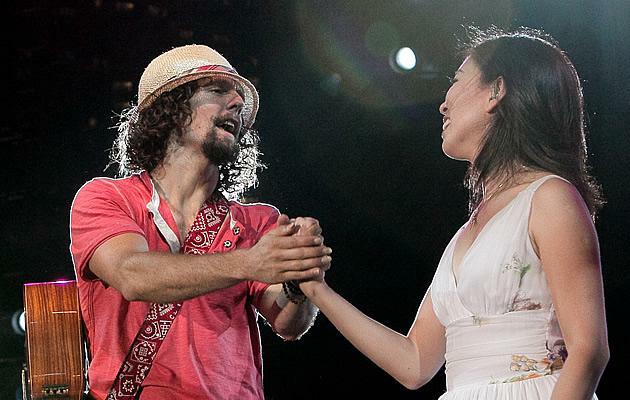 Maybe it had something to do with Singapore being the last leg of his Asia tour, but Mraz was relaxed and in full nature-boy mode, bantering with the audience and making jokes in between performing hits like "You and I Both", "Lucky", and "Mr Curiousity". Although soft-spoken in person, Mraz displayed surprising power and control in his heartfelt crooning of "You and I Both" - teasing the audience by switching the lyrics at one point by deliberately confusing them as they sang along enthusiastically. "Sing along if you know the words ... all those people working late will be wondering what's going on!" he told the crowd to appreciative laughs. His voice, which can tend towards turning nasal on his faster tunes, displayed none of that strain on Friday. A guest appearance by home-grown indie star Corinne May on the duet "Lucky" was a clear crowd (read: swooning teenaged girls) favourite, her husky dulcet tones blending in perfectly with his lighter, brighter range. Mraz also demonstrated an impressive range of musical talent, with the violin, saxophone, trombone, flute, ukulele, harmonica, guitars, and tambourines making guest appearances throughout the concert. Just when the concert was starting to get a little too predictable, Mraz burst into an opera-inspired version of Mr Curiousity, singing in falsetto and getting the crowd on their feet. The balmy night ended with Mraz's "I won't give up" on a darkened stage, when some lucky members of the crowd became proud owners of guitar picks tossed out by Mraz and his very "earth-boy" style straw fedora. Post-concert, leaving the Meadow was a logistical nightmare, especially for several vertically-challenged fans who had no idea where they were going. Only three buses were on hand to shuttle the 15,000 strong crowd to Marina, and many had to make a claustrophobic, sweaty 45-minute walk from the meadow to the entrance of Gardens by the Bay that should have only taken 10 minutes if crowd-control had been better organised. In all, a really enjoyable, if not life changing concert from Jason Mraz at a venue that was perfect on paper (tree hugging pop star in the land of super trees!) but not so much in execution - Forgivable, given Friday was also the Gardens' debut use as a concert space.